Ivermectin is not useful against tapeworm. If you find tapeworm in a goat's stool, use Panacur or Safeguard to get rid of it. 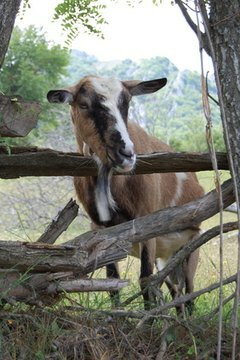 There is no known need for withdrawal from Ivomec prior to milking in cattle, but most goat users find it necessary to wait between 14 and 30 days. Most ivermectin products have withdrawal periods prior to slaughter for cattle. Times for goats may vary. Since goats do metabolize faster than cattle, it is safe to assume the use of the labeled withdrawal times for cattle. The common withdrawal times range from 35 to 56 days. Goats and sheep are often overlooked when it comes to livestock wormers. There are wormers for almost every other type of livestock. Ivermectin is a popular livestock wormer that has labeled uses for horses, swine and cattle, but not goats. One of the biggest problems is that goats metabolize drugs faster than most other common livestock, so they use the same drugs in a different fashion. Buy cattle strength injectable ivermectin. There are two brand names for the product: Ivomec, a 1 percent sterile ivermectin solution for cattle and swine made by Merck, and Double Impact, a 1 percent sterile ivermectin solution for cattle and swine by Agrilabs. The products come in injectable and pour-on methods, and are marked that way on their labels. Use 1 milliliter per 50 pounds of animal of the injectable types of ivermectin. Give 1 milliliter per 10 pounds of animal of the pour-on types. Ivomec comes in 50 milliliter and 200 milliliter—buy the volume closest to the amount you need for your herd, but the product stores well as long as you keep it in a cool, dry place. Give the Ivomec orally; inject the dosage into the side of the mouth with a needleless syringe, or dosing gun. The product is labeled for injection, but it works better in goats and sheep when given by mouth. Pour-on ivermectin products work the same way, and are given orally to goats and sheep. Use Ivomec Plus if you suspect liver flukes (a type of worm that invades the liver). Dose at 1 milliliter per 50 pounds and give orally. Tami Parrington is the author of five novels along with being a successful SEO and content writer for the past three years. Parrington's journalism experience includes writing for eHow on medical, health and home-related topics as well as writing articles about the types of animals she has raised for years.